Telling a lie was the "worst sin" that could be committed in his household growing up, the former FBI director once recalled. He's a Republican born into a wealthy family in New York who attended a tony prep school, graduated an Ivy League university, is known for his trademark suits and hair — and isn't someone you want to be on the wrong side of. Robert Swan Mueller III is also the man behind the most highly anticipated document in the country — the special counsel report, submitted to Attorney General William Barr on Friday, on whether Donald Trump's presidential campaign was involved with Russian efforts to interfere in the 2016 election. Pressure is unlikely to rattle Mueller, 74, who was named special counsel in May 2017. A decorated Vietnam War hero, he was the second longest-serving FBI director in the history of the agency, which he took over one week before the 9/11 terror attacks. Author Garrett Graff, who has interviewed the media-averse Mueller at length over the years, told The Guardian he is "probably America's straightest arrow, very by-the-book, very professional." In a 2017 speech at his granddaughter's high school graduation, Mueller exhorted the students to live their lives with "integrity, patience and humility." "Whatever we do, we must act with honesty and with integrity, and regardless of your chosen career, you're only as good as your word," Mueller told the graduates. "If you are not honest, your reputation will suffer, and once lost a good reputation can never, ever be regained." Mueller was born in New York City in 1944, and raised outside of Philadelphia. His father was a World War II Navy veteran and an executive at DuPont. "A lie was the worst sin" in his household, Mueller once told Graff. "The one thing you didn't do was to give anything less than the truth to my mother and father." He attended Princeton, where he said he was inspired to enlist in the Marines by a classmate who had been killed in the conflict. Mueller's first attempt to sign up was unsuccessful because of an injured knee. It took him a year to rehab the injury — time he also used to earn a master's degree in international relations and marry high school sweetheart Ann Standish, a teacher. He was then given the green light to go into officer training at Quantico, Virginia. His success there got him sent to elite Army Ranger training before he was shipped off to Vietnam as a Marine lieutenant and rifle platoon leader in 1968. He was awarded several commendations, including one for rescuing a wounded Marine under heavy enemy fire, and another for holding his position and fighting on even after he'd been shot through the leg. “Although seriously wounded during the fire­fight, he resolutely maintained his position and, ably directing the fire of his platoon, was instrumental in defeating the North Vietnamese Army force,” the Navy commendation read. He left the Marines after being placed on desk duty following his combat tour, but still considers those three years the most important of his life. "The lessons I learned as a Marine have stayed with me for more than 40 years," he told his granddaughter's class. "The value of teamwork, sacrifice, discipline — life lessons I could not have learned in quite the same way elsewhere." 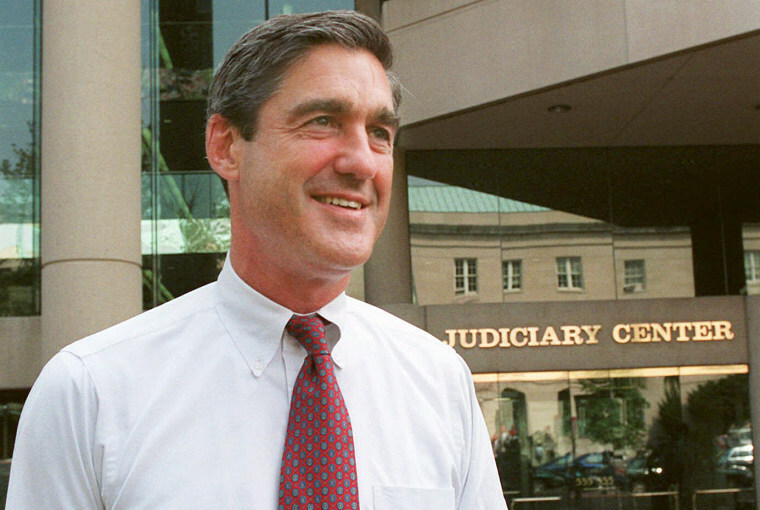 Mueller became a prosecutor in 1976 after graduating law school and doing a brief stint in private practice. He rose through the ranks at U.S. attorney's offices in California and Boston before landing at the Justice Department, where he was involved in high-profile prosecutions of the bombers in the 1988 Pan Am Flight 103 attack over Lockerbie, Scotland, and of the mob boss John Gotti. He was nominated as FBI director by President George W. Bush, and unanimously confirmed by the Senate. He was sworn in on Sept. 4, 2001 — one week before the country was hit with the deadliest terror attack in history, coordinated passenger jetliner attacks that killed thousands in New York, Washington and Pennsylvania. Mueller said in a briefing in the days after the attack that Bush asked him, "What is the FBI doing to prevent the next terrorist attack?" "That was the question that was asked on that day that I did not have an answer to," Mueller recalled in a 2014 speech. And he said he made it the FBI's main mission. "No longer could our metric be the number of arrests, number of indictments, number of convictions," he said. "It was answering that one question." There has not been a large-scale terrorist attack in the country since. Mueller and then-acting Attorney General James Comey nearly quit their jobs in protest in 2004, when White House officials quietly reauthorized a secret post-9/11 domestic surveillance program against the recommendations of the Justice Department. The pair took their concerns directly to Bush, who ordered the program restructured, Comey later told the Senate. Mueller's 10-year term was extended for two years by President Barack Obama and a unanimous Senate vote. He was succeeded by Comey and returned to private practice as a partner at the law firm of WilmerHale in Washington, D.C. Among his clients in the reported $3.4 million a year job were Facebook, Apple and the National Football League. He continued living at the longtime Georgetown home he shares with his wife of 52 years. They have two grown daughters and three grandchildren. Trump fired Comey on May 9, 2017, and told NBC News' Lester Holt two days later that he'd done so in part because of his frustration over the Russia investigation. On May 16, Trump interviewed Mueller about coming back to his old job. A day later, Deputy Attorney General Rod Rosenstein named Mueller as special counsel in charge of the Russia probe. While Trump has belittled Mueller as "a conflicted prosecutor gone rogue" who's running a "witch hunt" of an investigation, Mueller and his team have not responded publicly to the president's criticisms. He once told Graff the importance with which he views self-control. "I've always made my bed and I've always shaved, even in Vietnam in the jungle. You've put money in the bank in terms of discipline," Mueller told him. "Once you think about it — do it." Mueller felt Vietnam had prepared him for anything. "You see a lot, and every day after is a blessing," he said in 2008. "A lot is going to come your way, but it’s not going to be the same intensity."